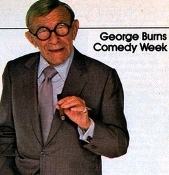 As he was age 89 when the show premiered, George Burns was billed as the oldest person ever to "star" in a television series. Burns had been around television in one way or another since shortly after its inception; like many old-time radio stars he had brought his routine over more-or-less intact from the older medium. However, his actual role in this series was rather slight; aside from lending his name, introducing the night's program, and providing an occasional voice-over narration, Burns was not involved in any of the episodes as an actor and those who tuned in expecting to see him as such were disappointed. Only 13 episodes were produced. This collection includes twelve shows. All the titles match the available list of shows except one.. "The Mission" which is prominetly listed as episode number 9, is most likely "Ivan and Boris in Las Vegas." PLEASE NOTE: These are extremely rare episodes. We only have them because some collector had the foresight to record them in 1985. Therefore these shows are transfers from VHS. The quality however is pretty good, considering the source. On a scale of 1 - 10, we rate them at 8.5. And may we add, they are fun to watch!